Although seldom considered a truly aquatic species, typical of moist sandy or gravelly (rarely clay) shores, ditches, fields, interdunal flats and beach pools, exposed lakebeds, clearings, borrow pits and other excavations, usually at or near the water table; fens, wet prairies, conifer swamps, lowland forest, meadows; rock crevices along Lake Superior. A common, widespread, and variable species. The most pubescent extreme has been called var. nuttallii (Greene) Sieren. The heads are all (with only a rare exception) sessile in little clusters of 2 or more on peduncles, while in E. caroliniana at least an occasional head is solitary on its own pedicel. 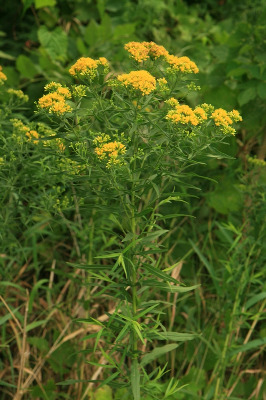 This is generally a more robust plant than E. caroliniana, with larger leaves and more florets per head, but the involucres are about the same length. The phyllaries are ± green-tipped. The sessile and somewhat broader heads give a more dense or crowded look to the inflorescence at the ends of the branches. MICHIGAN FLORA ONLINE. A. A. Reznicek, E. G. Voss, & B. S. Walters. February 2011. University of Michigan. Web. 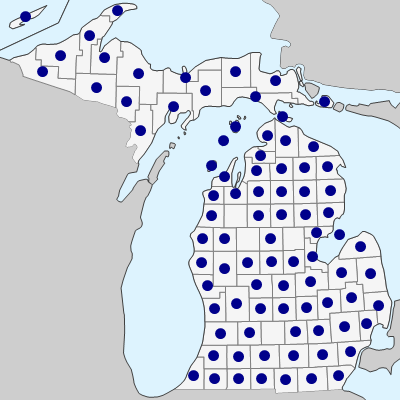 April 21, 2019. https://michiganflora.net/species.aspx?id=328.